The City is improving cycling infrastructure near the York University Keele Campus and in the Downsview Neighbourhood. This will provide bike connections to Downsview Park, the Black Creek Ravine system and major transit stops and stations on TTC Line 1 and the future Finch LRT. In June 2018, Toronto City Council approved the installation of the proposed cycling routes for the York University and Downsview Cycling Connections project. The next steps will see the installation of the cycling facilities in stages. Installation began in August 2018 and will continue through 2019. Please refer to the News and Updates tab for the latest information. The Toronto and Region and Conservation Authority will be upgrading the Black Creek Trail at Shoreham Drive beginning in April 2019, with work to be completed in September 2019 (timing subject to change due to weather). The scope of work includes the construction of a 130 metre by 3 metre wide paved trail, which will improve trail conditions and active transportation connections in the area. To ensure public safety, the section of trail within the limits of construction will be closed for the duration of the work. From early to mid-November, a bike lane and shared lane (“sharrows”) will be installed on Dovehouse Avenue from Keele Street to Sentinel Road. The bike lane will be installed on the south side of the street, running eastbound. The shared lane will be installed on the north side of the street, running westbound. The Dovehouse Avenue bike lane and shared lane will form an important cycling connection between Downsview Park and the existing Sentinel Road bike lane. Please refer to the installation notices below for more information. In June 2018, Toronto City Council approved the installation of the proposed cycling routes for the York University and Downsview Cycling Connections project. The next steps will see the installation of the cycling facilities in stages, starting in August 2018 and continuing into 2019. A section of the Shoreham Drive portion of this project, from the Pond Road to the Black Creek Bridge, is slated to be installed in late August 2018. The Shoreham Drive cycle tracks will provide a significant new route for cyclists travelling to and from the campus and connecting with the Black Creek Trail. The City’s Council-approved Cycling Network Ten-Year Plan identifies existing, planned, and proposed cycling facilities across Toronto. The cycling facilities near York University and in the Downsview Neighbourhood will be partially supported by federal funding, which requires that they must be constructed in 2018. The City is looking at a number of new cycling routes in both neighbourhoods, including bike lanes, sharrows, and boulevard trails. The bike lanes listed below are proposed, and City staff will need approval from Council before constructing these facilities. The sharrows listed below are planned, and City staff can move forward to construction without Council’s approval on these individual routes. The project team is seeking feedback on both the proposed and planned cycling routes and designs to ensure they meet the needs of the community. Date: Thursday, March 1, 2018. Location: Grandravine Community Centre, 23 Grandravine Dr. Location: St. Jerome Catholic School, 111 Sharpecroft Blvd. Why is the City proposing new cycling facilities? These majority of these cycling facilities were included in the Cycling Network Ten-Year Plan to improve the cycling infrastructure in York University Keele Campus and the Downsview Neighbourhood. This infrastructure will provide connections to Downsview Park, the Black Creek Ravine system and major transit stops along Line 1 and the Finch LRT. What are the project boundaries? 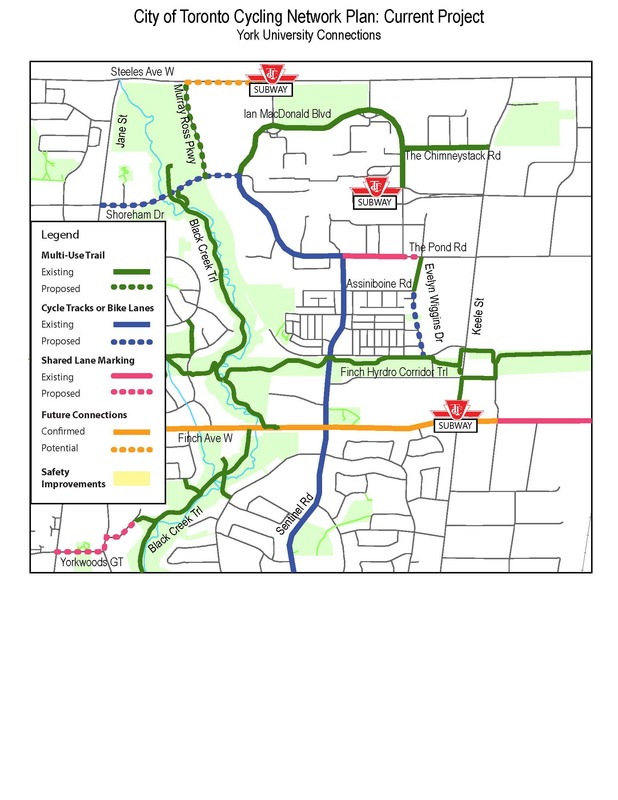 The study area for the York University (Ward 8) cycling facilities is bounded by Steeles Avenue West, Jane Street, Finch Avenue West, and Keele Street. The study area for the Downsview Neighbourhood (Wards 8 and 9) cycling facilities is bounded by Jane Street, Wilson Road, Keele Street, and Finch Avenue West. What types of cycling facilities are being considered? The City is proposing to install bike lanes, boulevard trails, and sharrows on various routes, as well as improved pathways to ravine trails (identified on the map). Bike lanes are a dedicated space for cyclists where motorists are not allowed to park, stop or drive. Bike lanes are painted on the road with bicycle symbols and a solid white line, and most importantly, a diamond symbol. The diamond symbol is used on Ontario roads to indicate that a lane is a “reserved lane”. Shared lanes or ‘sharrows’ are road markings used to indicate a shared environment for bicycles and motor vehicles. The shared lane markings highlight cycling routes alerting all road users to the presence of bicycle traffic on the street, and may also be configured to offer directional and wayfinding guidance for cyclists. The shared lane marking is not a dedicated cycling facility, but a pavement marking which has a variety of uses to support a complete bikeway network. Boulevard trails are two-way paved surfaces that run along a roadway and are designed for pedestrians, cyclists and other non-motorized users. Trails are at or near sidewalk level, above and away from the curb and roadway. Ideally, separate sidewalks are also present, and if so buffers exist between them. The City is planning a number of public consultation events in Winter 2018 to provide information on the proposed cycling routes and gather feedback. What cycling connections are proposed to York University? 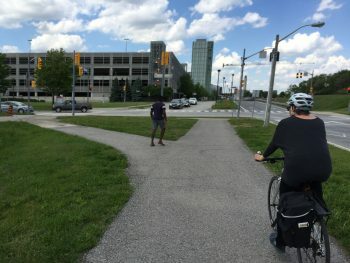 To enhance connections to York University, the City is proposing cycle tracks or bike lanes on Shoreham Drive (from Jane Street to the Pond Road) and Evelyn Wiggins Drive (along with a connection for cyclists to the adjacent trail that runs from Evelyn Wiggins Drive to the Pond Road). 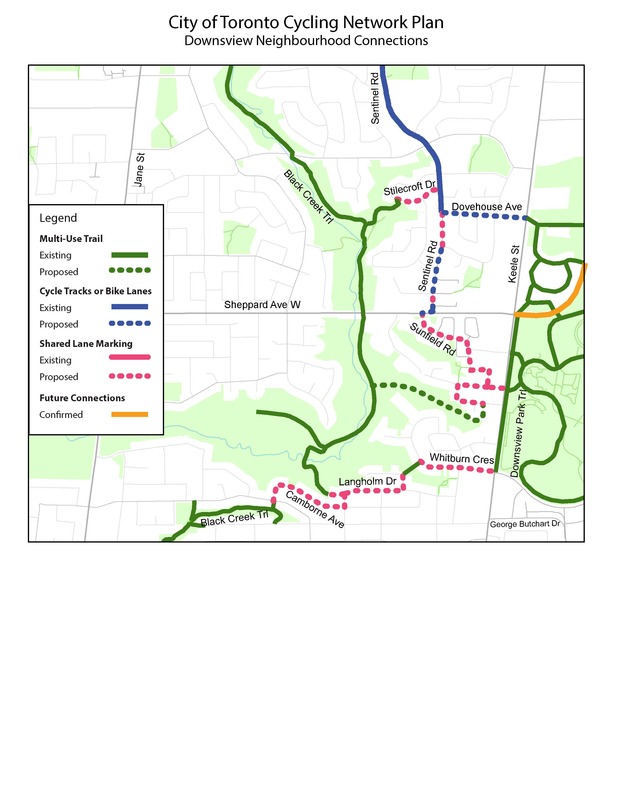 The City is also proposing a boulevard trail on Murray Ross Parkway (from Shoreham Drive to Steeles Avenue West), improved connections to the Black Creek Ravine, and extended sharrows on the Pond Road. The City is working closely with York University to coordinate efforts and plan for cycling connections within and beyond the campus. Please visit the York University Transportation Services website for more information on cycling at YorkU. What cycling routes are proposed in the Downsview Neighbourhood? Will there be a physical separation on the proposed bike lanes, such as bollards, curbs or planters? Yes, the City is considering physical barriers along the Shoreham Drive bike lane. Feedback from the public is welcome on this design. The City is currently consulting on the proposed cycling routes with stakeholders and the local community. City staff will then recommend these routes to City Council for approval before moving into construction. The City is hopeful that construction will begin in 2018 and be completed in 2019. Half of the project falls under City of Toronto capital funding, and half is contributed by the Federal Government. More information is available on the Federal Government’s website. Will the proposed bike lanes affect on-street parking or traffic lanes? Most bike lanes will not affect on-street parking. On some segments, parking studies have been conducted and public feedback will be sought to determine if parking demand can be met with the inclusion of dedicated bikeways. Will there be private property impacts? No. All new cycling facilities will be constructed within the City’s right-of-way. Will the bike lanes be cleared of snow? Yes. The bike lanes will include a maintenance program for snow clearing and street cleaning. How do bike lanes affect waste pick-up and emergency services? How do bike lanes affect TTC bus stops and Wheel-Trans? 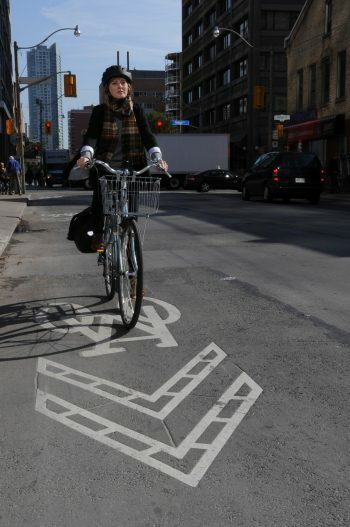 City staff will develop the bike lane design in consultation with TTC staff. City staff will continue to work with the TTC to accommodate curb-side bus stops, and consideration for Wheel-Trans passenger boarding. Where can I access information and resources on cycling in Toronto? Visit toronto.ca/cycling to view information about cycling in Toronto including programs to start cycling and safety information. To receive project updates, sign up for the email list by contacting Sr. Public Consultation Coordinator Andrew.Plunkett@toronto.ca. Under the Public Transit Infrastructure Fund (PTIF) – Phase 1, the Government of Canada is investing up to $309,500 for the York University and Downsview Cycling Connections Project. The City of Toronto is matching this funding contribution.